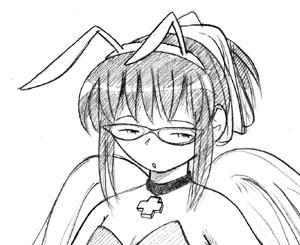 "Megatokyo joins Dark Horse Comics"
Well, it's been a very interesting few months here at Megatokyo. To say it's all been a whirlwind would be a bit of an understatement. Back when Megatokyo first went online three years ago, I had no clue of what I was getting myself into. It's sort of like scrambling up a mountain, looking back and not having any clue how you managed to get yourself where you are. I've been clambering over some pretty difficult terrain lately, but I've reached a spot now that has the kind of view that makes it worth the climb. I would like to announce that I have gone with Dark Horse Comics as my new publisher, and that we are already working to bring the long awaited Megatokyo Volume 2 to store shelves this January. You can view the official press release here. Those of you who pre-ordered book 2 from IC Entertainment will receive your copy of Volume 2 from Dark Horse when it is released. I have the list of pre-orders in my possession, and I will be contacting you to verify shipping addresses in the next few days. Please wait until you hear from me regarding your pre-order, as more specifics are forthcoming. The IC Entertainment edition of Megatokyo Volume 1 will not be reprinted - once the current supply of books are gone, they are gone. There will be a new and revised Dark Horse version of Book 1, at the larger trim size, with a new cover and even more additional material that will be released sometime this spring, after Volume 2. Needless to say, I am very excited about working with Dark Horse Comics. 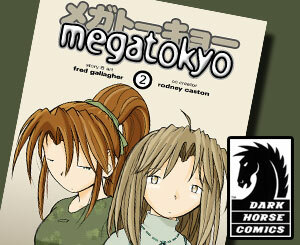 Years ago, when the idea of printing Megatokyo was not something I took seriously, I was sometimes asked what publisher I thought would be best for MT, my answer was always Dark Horse. I've always felt that the quality of their books were exceptional, so much so that it was one of the 'Ah My Goddess' volumes that I used as a model for what I wanted my books to look and feel like. With Dark Horse's quality standards, I know that both book 2, the re-issue of book 1, and any subsequent projects I do with them will more than satisfy my expectations and give the MT readers books they will enjoy owning. I feel honored and humbled by the attention that Megatokyo has attracted over the past few months. I've managed to get a very interesting overview of the comics and publishing industry, and I think that now is not only an exciting time for myself and my works, but for other owner-creators as well. The success and popularity of graphic novels and related works has a future that goes beyond just Japanese produced manga/comic titles. I feel that there is a lot of great work out there, and that people far more talented than me will also be able to put their work in front of a lot of people. All they need to do is keep climbing, and never mind the scruffs and scrapes - the view is worth it. Finally, the news is out. We found out that the Dark Horse/Megatokyo publishing agreement had been signed, sealed, and delivered while on the Bluewater bridge on our way to Canada. I found it really difficult not to blurt out everything during the CN Anime convention. After several weeks of keeping the secret and constantly monitoring what I could or couldn't say - it was almost too much for me. Each panel we presented had the obligatory 'What about Volume 2?' question. Gah, don't ask me! I wanted to do my happy dance. Lucky for everyone, I have forgotten, both mentally and instinctively, the happy dance and the little song that went with it. When Fred first mentioned publishers I was clueless. All I knew was from my childhood of reading 'Nancy and Sluggo' and 'Archie' comics and more recently the library debate about whether comics and graphic novels belong in libraries. Personally, I would have thought that debate was ended with the release of the Maus novels by Art Spiegelman, but alas. Our trip to San Diego Comic Con didn't help and after we returned I convinced Fred to take me to a local comic book shop to do some research. Fred ended up wanting to leave long before I did. I'm really impressed by the quality and variety of genres published. There is more out there than superhero comics and imported manga titles. The publishers, from large to small, and the independent comics are supporting a creative community of artists and writers. While Megatokyo is the latest addition to the Dark Horse titles, they have been publishing unique and artistic titles for two decades. Fred and I were impressed with their reputation and commitment to high quality publishing. I love their eclectic selection in style, story, and format from the chibi 'Lone Wolf and Cub' to the 'Ring of Nibelung'. I am also particularly fond of the "What's Michael' series. Many years ago, before Megatokyo was even an electrical impulse crossing someone's synapses, Fred got me a copy in an effort to gently introduce me to his world of graphic novels, manga, and anime. He knows I'm a sucker for cats. I've taken up his passion and added the librarian twist with an interest in intellectual freedom and the efforts of the Comic Book Legal Defense Fund and the Friends of Lulu organization which promotes female creators and increasing female readership. I've also poked around and found other interesting sites, like Sequential Tart, an amusing and informative site that works to raise awareness of the influence women have had on comics.